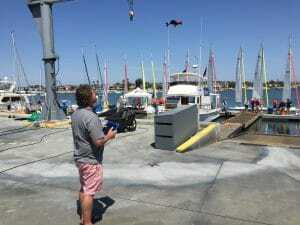 In April I spent an amazing weekend at Newport Harbor Yacht Club in Newport Beach, CA! 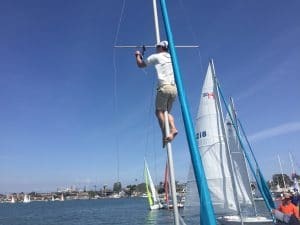 I was there to put together daily videos for their annual Baldwin Cup, an adult team race sailed in Harbor 20’s that attracts some of the country’s best team racers. It’s an invitational event between yacht clubs and holds no international significance, but the talent pool at this event is amazing nonetheless. Why? Because every attendee receives the Newport Harbor Treatment. NHYC goes all out for the Baldwin Cup: wooden placards announcing each matchup, made-to-order omelettes, a 40-person pit crew to service the boats and keep them in top condition, twenty-five cent beers daily, and one of the best regatta parties in the country, complete with buffet stations and a live band. They take their media coverage just as seriously, with photos, a website, and a mobile app produced by member volunteers (who are also highly skilled professionals in their industries.) For video, member Amy Halvorsen acts as the on-screen host, and this year Nik Froehlich flew a drone, but I’ve been lucky enough to be the only hired member of the media team. With that kind of amazing support and hospitality, shooting and editing video of the amazing racing is more of a joy than a chore. I can only hope to continue to cover this amazing event and get my yearly treatment.